The final countdown begins - It's November, and that means there's only one month left for Toybox's time on the recruit program. Let's look back at the last week in Pop Culture before looking ahead to the rest of the month. First off, I'd like to apologise for the barren nature of the page today - as you'll have seen elsewhere, Kinja has largely been on lockdown for most of the day, meaning I've missed a post (and one of them happened to have triplicated itself. Ooh err). But at least it's functioning for now! 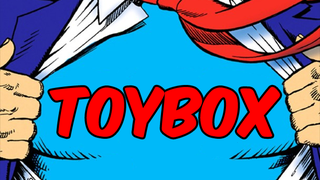 It was a solid end to what turned out to be a strong month for Toybox, with the average for the month finishing up at 842k US monthly people - an amazing feat to be over 500k above the target suggested for Recruit sites per month, and one I still can't believe the site has hit. It's all down to your fabulous support, and I can't thank you all enough. November's going to be a tough one - when October's two smash hit data points leave the month on Quantcast there'll certainly be a knock to the average, in fact just factoring in 1 less day brought the site down to 825k as of November 1st - but hopefully there'll be a few surprises on the way and Toybox can wrap up its time on Recruits with a bang. I hope you'll continue to join me for the ride! This week was dominated by Superheroes - we wondered why superhero TV seems afraid of naming its characters, and then of course was the major news of Marvel's Phase 3, so we took a look at the lesser-known characters who'll be dominating the big screen in the future. But it wasn't all caped crusaders, we looked at fictional board games from Sci-Fi and Fantasy we'd love to play in real life, saw oodles of lovely new toys, from Funko Pops to Hot Toy's latest Star Wars goodness, and some spectacular pre-Halloween cosplay, from both Humans and Dogs. Here's the last week in Pop Culture. Why are we still afraid of naming Superheroes?